Nehemiah was a master builder. He saw a problem and took ACTION. Against all odds he rebuilt the wall around his beloved city, Jerusalem, in an amazing 52 days. How did a relatively ordinary person accomplish such a task in such a short period of time? Nehemiah accomplished the impossible because he trusted God to use him for His purposes. It was a God ordained mission and Nehemiah knew if he followed God's plan, it would be accomplished. Nehemiah mobilized the people in the city to work on their own piece of the wall. They had a personal commitment to build a solid structure as they knew it was critical to give protection around their own homes. The people followed Nehemiah as he was a committed leader. He exhibited great courage and tenacity, persevering through many trials, along the way. He never gave up, however, as Nehemiah loved the Lord and wanted to fulfill the task which was given to him. 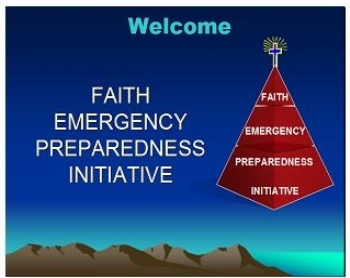 The FAITH EMERGENCY PREPAREDNESS INITAITIVE has been patterned after Nehemiah's strategy. The crumbling wall is the disconnect between church and community. The foundation has been laid and the wall is being built, connecting the church with the community in which it is found, ready to care for its neighbours. Please click on "More FEPI" for menu.